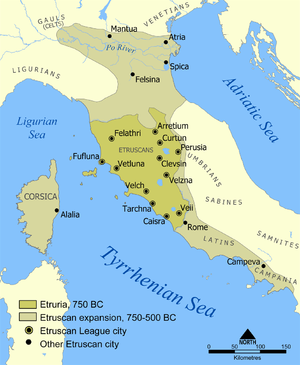 Their language is related to the Tyrrhenian language family and is not clearly related to other languages. Some Etruscan letters were used by the Romans in the Latin alphabet, which English uses. Some Romans, such as Cicero, were fluent readers of Etruscan, but few of the writings survive. ↑ Rix, Helmut 2008. Etruscan, in The ancient languages of Europe, Roger D. Woodard (ed) Cambridge University Press, pp. 141-164. ↑ Spivey, Nigel 1997. Etruscan Art. London: Thames and Hudson. This page was last changed on 8 July 2017, at 04:42.